[S176] Christening Certificate (Reliability: 3). was baptized by me in no. E. Church, Negaunee, Mich.
on the 14th day of March in the year of our Lord 1897. [S161] Death Certificate, Laura L. Waters. time of death - 2:50 a.m.
and Mrs. Ameliz Symons of Negaunee. 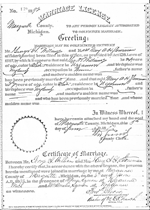 [S160] Marriage Certificate (Reliability: 3).